Houston is well served by interstates and freeways and getting from one side of the city to the other is straightforward due to the I-610 and other orbitals. There are two major airports serving the city that receive major national and international carriers, while travel by bus and train into the city is another option with numerous connections by Greyhound Lines buses and Amtrak trains. Within Houston, the city's METRO buses and trains provide efficient travel options to the key visitor areas. Located to the north of the city, George Bush Intercontinental Airport Houston is Houston's main airport and is served by all the world's major carriers. Facilities at George Bush airport are excellent and taxis, shuttle buses and regular buses run to and from the airport to downtown Houston and other convenient areas of the city. The taxi ride downtown is fairly expensive and takes about 40 minutes, while Express Shuttle USA also runs downtown and to Houston's major hotels for a lot less, as do bus services and the METRO system. For further information, please refer to the Houston George Bush Airport page. William P. Hobby Airport is closer to the city than George Bush Intercontinental Airport and receives domestic traffic mainly via Southwest Airlines. Taxis are cheaper to the city from here than they are from George Bush Intercontinental Airport and Express Shuttle USA buses travel to downtown, the Galleria area and Greenway Plaza. Both of Houston's airports have offices for all major car rental companies at each of the terminals. John F Kennedy Boulevard and the Eastern Freeway feed George Bush Intercontinental Airport, while I-45 is the easiest route into town from William P Hobby Airport. 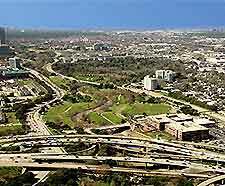 Houston is well fed by the north-south I-45 and east-west I-10, both of which pass travel through downtown Houston, while the orbitals of I-610 and Sam Houston Tollway provide access to the city's outskirts. 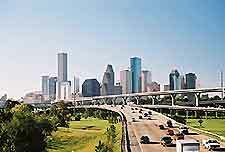 Book your Houston HOU Car Rental here. 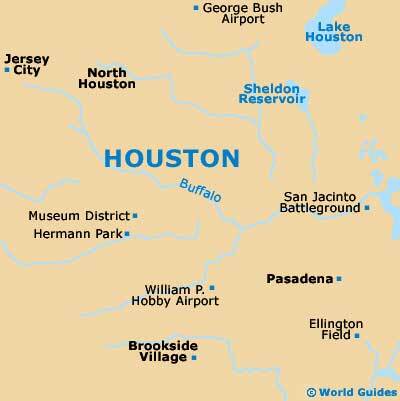 Houston is a long way from most US cities, making bus travel to Houston uncomfortable due to extra-long journey times. However, bus travel is the cheapest way to get to Houston and the Greyhound bus network serves Houston from cities throughout the country with several return services per day. Within the city the METRO bus system runs from George Bush and Hobby airports to downtown Houston and other locations in the city. The main railway station in Houston is the Southern Pacific Station at Washington Avenue and Amtrak trains travel here daily from Los Angeles, Chicago and New Orleans. Houston's efficient METRORail service runs to many of the city's major areas including downtown, south of Reliant Park, Main and Fannin streets, Midtown, the Museum district, Hermann Park and the Texas Medical Center. The METRO is wheelchair friendly and is the most convenient way to travel within the city. The spread out nature of Houston makes travel by taxi quite expensive and journeys are charged per mile, with initial pickup surcharges and extra surcharges from the airports.